Hear how others have transitioned to the NDIS via NDP’s dedicated NDPtv news channel. Season 2 (2016) – 'Change up' is a new series which will help you prepare for the NDIS and thrive into the future. 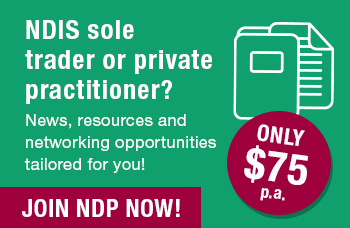 It will shine a light on the professional needs and interests of NDP members and will feature your peers and colleagues sharing their stories and experiences. Episode 1: Core Standards Program Part 1 looks at how we can support you through the transition into the NDIS and introduce the Core Standards Program delivered by the Clinical Innovation and Governance team from Ageing, Disability and Homecare – part of the Department of Family and Community Services NSW. Episode 2: Core Standards Program Part 2 continues to examine the Core Standards Program delivered by the Clinical Innovation and Governance team from Ageing, Disability and Homecare – part of the Department of Family and Community Services NSW. Episode 3: Abuse and neglect explores the concepts of human rights, abuse and neglect and for explores National Disability Services' Zero Tolerance initiative and what it means for disability service practitioners. Episode 4: The NDIS Experience takes you on a trip to Canberra where we speak to disability sector practitioners who’ve made the transition into the NDIS and asked them to share their experiences and insights of working under the scheme.